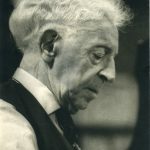 Arthur Rubinstein (1887-1982) was born in Lodz, Poland, the youngest of seven brothers, who at the age of two already demonstrated extraordinary talent for playing the piano. When he was seven years old he took his first steps on concert stages, playing works by Mozart, Schubert and Mendelssohn. Despite appearing as a soloist with the Berlin Philharmonic Orchestra at the young age of 13, it was only in his forties that Rubinstein received international acclaim. For Rubinstein music was an expression of emotions. In 1974 he gave his name to the International Piano Competition in Tel-Aviv, where he also served as an adjudicator (as well as on the second competition in 1977). Rubinstein retired from the stage at the age of 89. His last performance was in May 1976 at Wigmore Hall in London, a venue he played for the first time about 70 years before.